My family looks forward to pizza night on Friday. We’ve tried all sorts of combinations for toppings. My kiddos keep trying to convince me to make a Mac and Cheese with Hot Dog Pizza … but thus far, I can’t bring myself to do it. It’s desecration to me … They think they’re onto something. If When I do decide to make Mac and Cheese with Hot Dog Pizza for them, I think I’m going to make this Tomato Spinach Alfredo Pizza for me! 😉 It is my favorite homemade pizza so far! I might try a small sliver piece of theirs to be a good sport …. Because you know I’m gonna make that pizza one of these days … and any good Mom has to try their kiddos crazy concoctions … Right?! I use jarred Alfredo sauce for this because it is fast and easy. I find one jar easily makes 2 large pizzas. Also, feel free to make your own Alfredo sauce if you like. Although I use frozen spinach, this pizza would be just as tasty with fresh spinach, too! I provided a link to my favorite pizza dough from Frugal Upstate … I truly believe it is “the best” … and oh, so close to Pizza Hut! Preheat oven to 450° F. Grease two pizza pans. Pat dough into pans. Drizzle the dough with olive oil and bake for 10 minutes. Spread Alfredo sauce on the pizza crusts, using about half a jar for each pizza. Top each pizza with about 1-1/2 cups cheese. Top with spinach, garlic and tomatoes. Sprinkle 1/2-cup of cheese over the top of each pizza. If desired, lightly sprinkle Italian seasoning over the top of the pizzas. Bake for 15-17 minutes, or until pizza is golden and the cheese is bubbly. Serve hot! This looks delicious! Thanks for joining Foodie Friends Friday! Please come back next week with another great recipe. Looks sooo good! I love the combination of spinach and Alfredo! Great pizza! Thank you …. This is definitely my favorite pizza thus far! This sounds delicious!! I pinned it to try soon! Thank you for stopping by, Sheena! Let me know what you think! This is my husband's favorite pizza and I have not made pizza at home yet. Maybe I should dust off my stone and wheel cutter in the cabinet. This is inspiring me Jamie! Yay! 🙂 I bet he'd be super happy! This sounds like my favorite dip in pizza form! YUMMY! Thanks for sharing at the Weekend Potluck. Have a wonderful weekend! Wow – my faves all on a pizza. Yummers. This is my favorite pizza! Hope y'all have a great week! Oh, that looks so good! I'm hosting a linky party "One Creative Weekend" at OneCreativeMommy.com. I'd love for you to visit and link up this idea and/or anything else you'd like to share. This looks great, thanks for sharing it. I got some gluten-free pizza crusts and this is a wonderful way to make the pizza. This is a wonderful pizza! I love making my own dough as well! I recently found "the perfect pizza crust" thanks to Pinterest! Thank you for stopping by, Winnie! Found you on Foodie Friends Fridays! I am a pizza addict! I will have to try this out with my homemade alfredo sauce. Looks fantastic! I will be posting this as one of my Host Favorites this coming Friday, so check out my blog (www.familyfoodfinds.com) for your shout-out! Thanks for linking up! Jamie, That looks phenomenal!1 I pinned it. Yum…. Your pizza looks delicious. Great way to use fresh summertime tomatoes. This looks like a winner. Love it! Oooh Jamie, this looks so yummy! Putting 2 of my favorite foods together, pizza and spinach. Definitely have to try this weekend as I just bought some alfredo sauce. Thanks so much for sharing! I hope you make it back to share at the Frugal Treasures Tuesday party. Have a good week. Spinach is one of my favorite pizza toppings. Thank you for sharing your pizza with See Ya In the Gumbo! Mine, too! Thank you for stopping by! I would love this, I'll put it on my to try list! Yum! I hope you enjoy this as much as we do! Thank you for stopping by! Looks yummy! My family also loves pizza, so I am also always on a hunt for a 'grown up' pizza for hubby and I. Thank you for posting. This one is my favorite by a long shot! I hope y'all it enjoy it too! perfect! every thing about this..yummy flavors! As I started to write my comment, I couldn't think of anything to say except "holy crap". lol. This looks so fabulously awesome. I am a huge pizza junkie and this looks great. Thanks for sharing at our party this week. Hahahaha 🙂 I'll take that as the biggest compliment, Terry! Jamie, This is a great recipe! Hope you are having a great week end and thank you so much for sharing with Full Plate Thursday. As a top-viewed link, your delicious pizza will be featured during this week's See Ya In the Gumbo! This looks sooo yummy! Pinning. This looks so good! Thanks so much for sharing on Tout It! Hope to see you again. Home Run! I love this pizza! I found your recipe at Claiming Our Space. Thanks for sharing! Alfredo is my all time favorite pizza…love the tomato and spinach on yours!!! Have you ever heard of or been to a Cici's pizza? My kids favorite one their is the mac and cheese pizza:-) My youngest keeps trying to get us to make it at home, but no go so far!!! 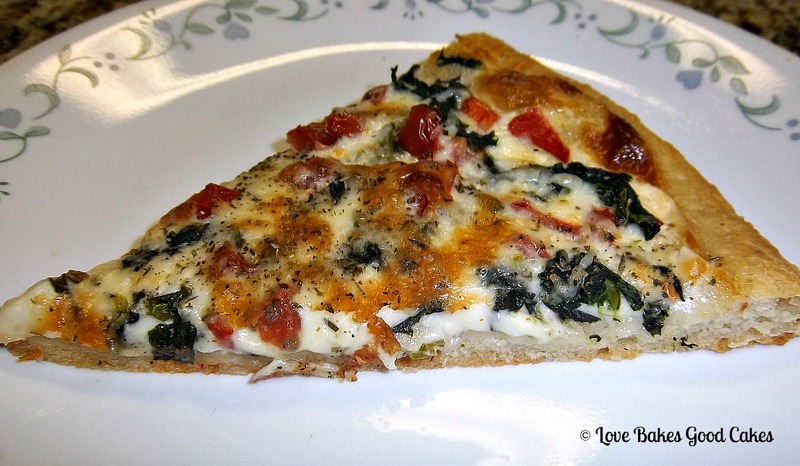 Yummmm – I love the combination of spinach & tomatoes & now on a pizza!!! – genius!! Thanks for sharing on my blog hop. Looks yummy, Jamie! Thanks for sharing at Foodie Friends Friday Pizza Linky Party!